Best of Istria: 25 Amazing Trips through Croatia's Terra Magica will take you on scenic trips through Istria, guiding you in your discovery of popular attractions, as well as obscure towns, and charming places off the beaten path. The book has just been published and is available for purchase on Amazon. This comprehensive travel guide, full of native knowledge and complemented with Google Maps, combines Toni Krasnic’s first-hand local experience of Istria with his work as a Croatia Local Guide and Google Maps. The book includes 25 unique trips through Istria organized around various interests, including outdoor fun, wine tours, food tastings, family adventures, and much more. 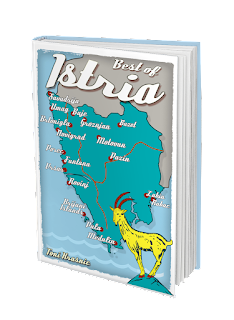 The book also offers practical information you’ll need when visiting Istria, and includes highlights of major towns, regions, and popular events. With full coverage of Istria, on and off the main roads, Best of Istria will take you from the outskirts of Istria into the heart of Terra Magica (magical land) of Croatia. Don't miss an opportunity to discover all the breathtaking views, hidden gems, and authentic local experiences with Best of Istria by your side as you explore this magical region.